All the rumors suggest that Apple will implement a Night Mode in iOS 13 along with news for Live Photos and other surprise features. We have been imagining for years how the Apple Night Mode will work in the software of your iPhone, iPad and iPod touch. Luckily, there are alternatives that we can try. But what do we do until iOS 13 arrives? 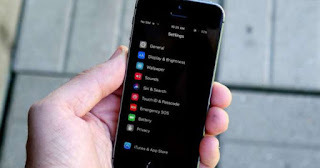 In this tutorial we explain, step by step, how to create your own night mode in iOS 12 and add it to the Control Center options of your iPhone and iPad. Follow these instructions to create a night mode on your iPhone, and then add it to your Control Center to activate and deactivate it more easily. 3. Go to Display settings. 4. Press on Invert colors. 5. Select the Smart Investment option. 7. Click on the Control Center section. 9. Add the Quick Functions option. 10. Activate the Control Center. 11. Press on the Quick Functions button. 12. Click on the panel of quick functions. 13. Select the Smart Investment option. And it would be! From now on you can activate and deactivate this personalized night mode with a single touch on the screen of your iPhone. The importance of this useful intelligent investment of colors is multiplied by two in the screens of the iPhone X, the iPhone XS and the iPhone XS Max. Since their screens are OLED, instead of LCD, the pixels of the black tones are completely deactivated and this causes the device to save an immense amount of energy . So this night mode will not only help your eyesight, but also your iPhone's battery!